Previous versions of LEED have treated low emitting materials as 5 separate issues each worth 1pt. 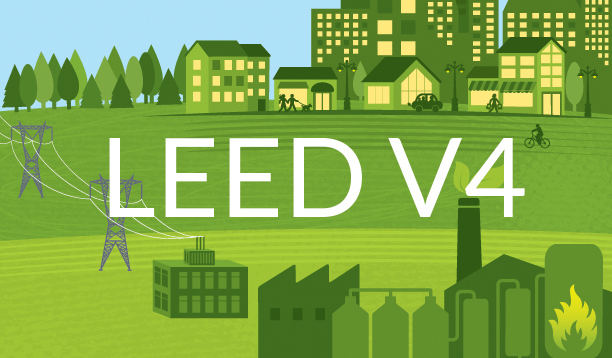 In LEED v4, all of these categories (plus a new one) have been combined into one credit called Low Emitting Materials that is worth only 3 possible points. Emissions testing has become the primary protocol for all products, but wet applied materials still carry the previous VOC content requirement like a cherry on top. While compliance may seem more simplified, perfect execution in at least 3 product categories is required which means the bar is set pretty high. You’ll need some proactive strategies. Assuring compliance for adhesives, sealants, paints or coatings before LEED v4 meant comparing grams per liter of VOCs in the product against VOC limits set by California regulations or GreenSeal standards. A project could provide product data with VOC content and receive a thumbs up or down on its use. If the product got a thumbs down, one could always resort to the VOC budget that allowed a weighted average approach but had the disadvantage of requiring the contractor to track applied volumes for that category of products. Now that third party emissions testing has become the overarching standard, VOC content compliance is no longer enough. Since third party emissions certification means testing and fees that many otherwise previously acceptable products have not yet invested in, LEED has declared a threshold of 90% by volume for the emissions part of the requirement. But both parts still apply so to achieve compliance in either the adhesive/sealants or paints/coatings category requires that 100% of products meet VOC requirements while 90% of them meet emissions requirements. The combination of these two requirements has some big implications. 1) If the wet applied product submitted meets the VOC limit but does not have an emissions certification, there is no direct yes or no response that can be given as to whether it complies. Compliance will come down to the relative amounts of all the products applied in that category that have emissions certifications. 2) Unless you are able to specify 100% emissions certified products, you have to track wet applied volumes for all products even when you are not pursuing VOC budget compliance. VOC budget compliance does still exist, but it too has suffered a sea change. It is now based on an assembly approach even for wet applied products. So if you were to use an acoustical sealant without an emissions certification and wanted to take the VOC budget approach, rather than counting up all the VOCs being used in the adhesives and sealants category and comparing that to the total allowed, you would need to consider your wall an assembly and evaluate compliance of every layer of materials applied to that wall including drywall, paints, etc. All of a sudden the compliance of this one particular sealant is a function of the percentage of surface area compliance of the whole wall (or ceiling or floor) of products. The obvious way to approach the wet applied categories with complete confidence would be to make sure up front that 100% of these products can provide third party emissions certifications. Recent project results indicate that while the paints and coatings market is very prepared to supply emissions certifications, the adhesive and sealant market is lagging behind in this regard. However, even if you successfully vet all your wet applied products up front to make sure they comply with both emissions and VOC content, you will find that you still have to track the volume applied of all of these products in order to successfully enter them in the compliance spreadsheet. After all, a volume based calculation needs volumes to calculate. Expect paints to comply with emissions requirements more easily than adhesives and sealants. Track your wet applied volumes. Find and specify products that have third party emissions certifications through testing organization websites like UL Environment or SCS Global Services that provide searchable product guides.